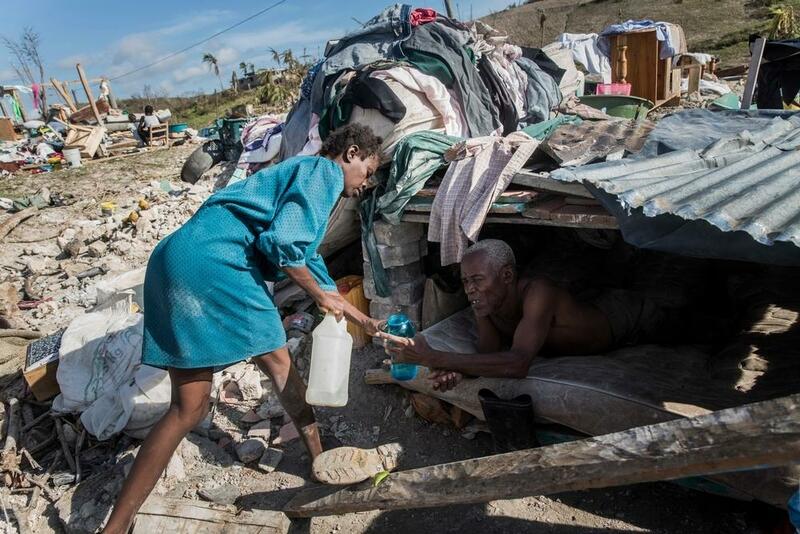 Three weeks after hurricane Matthew swept over the south-west of Haiti, thousands of people are still severely affected by inadequate shelter, insufficient food and drinking water. Some remote communities are still cut off and inaccessible. We are concerned by the deteriorating health status of children, women and men in hurricane affected provinces of Sud, Grande Anse and Nippes. Our teams see signs of food scarcity: most of the crops are destroyed or flooded and the vast majority of the livestock is missing or dead. “During our medical consultations, our patients tell us they don’t know how to feed their families,” says Emmanuel Massart, Project Coordinator in Grand Anse. In Sud and Grand Anse, MSF started to monitor the nutritional status of children under five during mobile clinics in order to treat them with ready-to-use therapeutic food if necessary. A boy carries fish in an area the suffered widespread destruction, near Port Salut, in southwestern Haiti. Hurricane Matthew tore through the Caribbean on October 4 and devastated large parts of the island. The force-4 hurricane blew away the roofs of most houses in the south-west of the country, and the heavy rains further damaged the rare houses that were still standing. “Entire families have lost their homes," says Renate Sinke, Project Coordinator in Nippes. "Their houses were totally destroyed. Wells, water networks and reservoirs have been damaged. “The hurricane damaged the precarious water supply systems," reports Yves Lyre-Marcellus, Water and Sanitation specialist in Nippes. "These systems were further damaged with the floods that followed the hurricane. "The people did not have access to clean water." Our teams assessed six wells on the coastline from Port à Piment to Les Coteaux, of which three were contaminated by salt water. In the valleys or mountains, water sources are sometimes mixed with unsafe river water or debris from landslides. Remote villages were already hard to reach before the hurricane but are now nearly inaccessible. “The two roads leading to the Baradères district are currently cut off," highlights Sinke. "People can’t come nor leave the district. Inaccessibility of remote villages is also impacting the provision of health care. “Upon arrival in Pourcine, a village in the mountains, we treated fourteen people with serious injuries and one woman who had a miscarriage,” explains Massart. “If open wounds are not treated properly, the patient goes into sepsis. As the number of patients with suspected cholera in MSF’s Cholera Treatment Centre (CTC) in Port à Piment decreased to six patients on 25 October, the neighbourhood town of Chardonnières reported forty suspect cases during the day. As the epidemic is unpredictable in current conditions, it is crucial to monitor new cases, provide sufficient treatment centres, access to these facilities and safe drinking water. MSF is concerned that the combination of lack of shelter, safe drinking water, food and access will lead to a deterioration of the general health status of the population. “Women, men and children are in a very vulnerable position”, explains Chiara Burzio, MSF Emergency Medical Coordinator. “We are particularly concerned of the heightened risk of infectious diseases, cholera, and a deteriorating nutritional status of children under five in the isolated areas affected by the hurricane."